Controlling Corruption -- Is It Only a Dream? On the occasion of Human Rights Day, Chairman of the National Human Rights Commission, Professor DR. MIZANUR RAHMAN (MR), speaks to Forum's Kajalie Shehreen Islam about the understanding of human rights in Bangladesh and the role of the commission. Forum: What difference has the National Human Rights Commission (NHRC) made in terms of human rights in Bangladesh? MR: We are celebrating 40 years of our independence. But the NHRC has been functioning since June 2009. But at that time it was turned into a one-person commission. Basically, from June 23, 2010 the newly reconstituted commission started functioning. Now we are a seven-member commission and in the spirit of the law it is a fully functional commission that we now have. So the journey has been from June 23, 2010 to today. The time is too short to really make any assessment but at least I can give you some examples where the establishment and functions of the commission have made a significant difference in the history of the nation, image building of the nation in the international forum as well as in the domestic affairs, some interventions that have made a difference. From the international perspective, during this very short period the NHRC has proved to be an independent-of-the-government institution functioning in line with the Paris Principles based upon which such national human rights institutions are established and therefore the International Coordinating Committee of National Human Rights Institutions (ICC) which is based in Geneva and the Asia Pacific Forum which is the forum of the National Human Rights Institutions of the Asia Pacific region, both these two international giant organisations have given recognition to the NHRC of Bangladesh so now we have these two very important international recognitions which amounts to UN recognition as the institution as an independent body and membership of the Asia Pacific Forum denotes that we are accepted as a member having national human rights institution functioning independent of the government and making the kind of contribution we are supposed to according to the Paris Principles. This has enhanced the image of the state in the international community. Forum: What difference has the NHRC made nationally? MR: We can give you scores of examples where our interventions have made a difference in the life of a particular person, beginning form domestic problems and disputes to the way lives have been saved in such high profile cases as those of Limon or Kader. Extra judicial killings, which have been the concern of the civil society and the international community, which was pointed out as the number one concern in the US Department of State report, a concern of Amnesty International, today we can very confidently say that because of the interventions of the NHRC the number of incidents of extrajudicial killings has visibly reduced. That is a positive development. Rapid Action Battalion (RAB) is being more patient and tolerant and not using their weapons as they used to between 2004 and 2009; they are being very cautious and patient and trying to use their weapons as the last resort. There may be some exceptions but the overall situation has changed. Forum: How can you attribute this visible reduction to the intervention of the NHRC? MR: On each and every occasion of an extrajudicial killing, we not only went public and made a public criticism of the incident but we immediately wrote to the Ministry of Home Affairs asking them to go for an acceptable, credible investigation, bring the perpetrator to justice and provide us with the investigation report. If we find it okay we accept it, if not, we reject it and ask the Ministry for the formation of a higher level committee and a second investigation. This puts pressure on the authorities as you don't want to always be rebuked in the media. In this age of information technology where the world has become a global village, what we tell, the whole world sees and it's a question of your acceptability and image in the eyes of the world and international community and so they're very careful. Forum: Is the concept of human rights unclear among people in Bangladesh? MR: We had just conducted a baseline perception survey in which 3,632 respondents of all categories throughout the country were interviewed. Fifty percent of the respondents had never heard the phrase human rights. Of the remaining 50%, a predominantly overwhelming portion were unable to describe what it meant, a lesser number knew that human rights are legally protected, and an even lesser number knew that there is a Constitution which protects human rights. Since independence, hundreds of thousands of NGOs have been functioning in this country, what have they been doing? The NHRC has a huge burden of going for public awareness of human rights. If you are not aware of your rights, you are not going to protect your rights. Only when you come to know can you say that you cannot take them away from me. Forum: What sort of awareness-raising initiatives is the NHRC taking? MR: For awareness raising, we will be having round the year series of training workshops on awareness targeting different groups -- media, doctors, police, students, NGO workers, etc. One of the components will be what I call 'street law'. With the help of law faculty, we will train law students, say from Dhaka, Chittagong, Rajshahi and other public and private universities, on specific areas of human rights and they will train other students of other universities with law departments who will in turn go to secondary schools and colleges, slums, factories, etc., and make people aware about their rights and obligations. This is how we want to bring about fundamental change in the awareness of human rights in the country. We will use the youth force because they are vibrant, they are not corrupt, they are honest, diligent; they want to do something for this country, bring about change. We believe in the Gandhian philosophy which says that if you fulfil your duties, your rights will be taken care of, as opposed to Western jurisprudence which is rights-based. So we at the NHRC also emphasise our obligations. Forum: Is it difficult to make people understand that economic, social and cultural rights are human rights? MR: All these aspects make up human beings. Cultural rights include, for example, the right to practise one's chosen form of dance; social rights such as to social security, or to exist as a distinct social group. Economic rights include right to wages, etc. In Bangladesh, whenever we talk about human rights, we basically turn to talking about civil and political rights. And we forget the main area of human rights intervention that we believe is the core obligation of national human rights institutions is the protection of economic, social and cultural rights. We never deny that the right to life is the most fundamental right. But the violation of economic, social and cultural rights is affecting millions of our citizens every day, hour, minute. We want to emphasise the protection of economic, social and cultural rights more, for that is probably the cry of millions of poor people of the country. Our training is also based on this. That drives us to run from hospital to hospital, school to school, to orphanages, to look into the situation in the child development centres, the vagrant homes in the country, to maternity and child care centres. We are doing this to ensure that whatever budgetary allocation is made for ensuring the minimum of economic, social and cultural rights, at least proper utilisation of such resources is done because then many more people than today would be benefited. 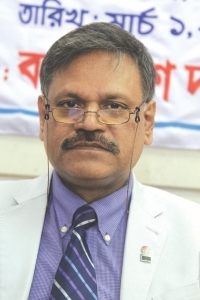 The Anti-Corruption Commission (ACC) has never gone to Dhaka Medical College Hospital (DMCH) to find out how the medicine and instruments are being procured in the market. Medicine which costs Tk. 80 in the market is being purchased for Tk. 10,000 -- can you believe the kind of corruption? But why did the ACC take so long to go there? They went after the NHRC found and made public that people are being deprived of free medicine and medical care that they are supposed to get according to the government provisions. We found the same situation around the country. Ultimately, it is the poor who are being deprived as they are the ones who go to the government hospitals. Our intervention has made even the ACC stand on its feet and look into those areas of concern. When we went to the orphanages, we saw that the per day allocation per child is some Tk. 4 with which they are provided with four meals a day -- is this possible? The monthly allocation was only Tk. 1,150 per child. We brought it to the notice of the government, that it must be increased and the government took it into consideration and immediately raised it to Tk. 1,900 per child in the budget. At the girls' orphanages/homes, there were girls from Class 1 right up to 10, there was no cook, the girls took turns to cook, I saw little girls carrying huge pots, cutting vegetables, cooking, etc. The moment it came to the notice of the Prime Minister, the position of 64 cooks was created so that the girls would not have to cook. It may seem like a small thing but it made a big difference in the lives of the little girls who were busy working and not living their childhood as children should. I was not allowed inside the Sylhet prison after we went to investigate allegations of corruption there. Prisoners cannot be treated inhumanly or tortured according to human rights standards. You must be given the amount of rice, etc., allocated by the government to prisons. My intention of visiting the prisons was to bring to the notice of the government the extent of corruption going on inside the prisons and that it must stop. Now the authorities know and I'm sure will take care. In one prison, the amount of corruption was Tk. 2,83,440. How much corruption is that in all prisons put together per year? The government gives money for food but the people are not getting it, the rice, oil, where does it all go? These are the areas in which we want to make a difference and we're trying to do that. Forum: What hindrances do you face in your work? MR: The bureaucratic system of doing things in our country makes things a bit difficult at times. Forum: How is a human rights culture practised within the NHRC itself? MR: All persons must be treated with dignity and respect in this office, beginning from the cleaner to the boss of the office, but also the visitors. People come to us because they have a problem, it may be beyond our jurisdiction, maybe we cannot give immediate solutions, they may want instant solutions, they may be impatient, but we cannot afford to be impatient with them. We may not be able to give them all solutions, but people should leave the office thinking that they got a patient hearing, they were treated well with dignity and respect. We also try to balance the organisation in terms of gender, ethnic background, etc., to make it a balanced and representative composition that reflects unity and diversity. Forum: What is the most pressing human rights issue in Bangladesh right now? What are the neglected issues? MR: I would say that the rule of law in its fullest manifestation in its true essence must be practised in the country. The rule of law is the ground on which the whole structure of human rights stands. If rule of law is weak, the structure will be weak, if it is strong, the structure of human rights will be strong. Basic needs should be recognised as fundamental rights of citizens. Education, health, shelter, clothing. These should be treated as not merely basic needs or fundamental principles of state policy but they should now be declared as fundamental rights and the state should allocate adequate resources for the promotion of these rights. We know there are limited resources and the country is poor but so is South Africa. Nelson Mandela has declared all these basic needs as fundamental rights. It is not that every South African citizen gets dialysis free of cost by the state, but the court always sees whether the government is making enough allocation so that gradually you reach a situation whereby these rights will be guaranteed to all citizens. That is the way we should see these rights; they have been neglected for way too long. Bangladesh is a state founded on the premise of respect for human rights in the words “to ensure for the people of Bangladesh, equality, human dignity and social justice”. When you combine these three values they equal human rights. We cannot betray the ideals and values of our Liberation War. If you want these values, the culture of impunity has to go, it has no place in the rule of law. Therefore, the crimes that were committed in 1971 must be dealt with very, very severely according to the law and this opportunity must not be lost. We are grateful to the government for starting the process. There has been some criticism, but the government believes in the rule of law. For the first time in history, a domestic tribunal, court, the International War Crimes Tribunal in Bangladesh, is prosecuting nationals for commission of international crimes. This will set a unique example, a model for the rest of the world. So if the government is a bit cautious it's fine, but we must deal with it and end the process so that the lesson is learnt that there is no impunity. Kajalie Shehreen Islam is In Charge, Forum.